We were riding in the car a few days ago and I was playing a new CD that had some children's Sunday school songs on it. As a new track started, Maggie piped up from the back seat. "Mom! Ms. Judy sings this song! Now I can learn the words and sing along better!" I said how nice that would be and isn't Ms. Judy sweet for teaching you those songs. "Yes, Mom," she said, "I love Ms. Judy because she does funny dances and plays horses with me, too." Ms. Judy is one of Maggie's Sunday school teachers, and the inspiration behind this project. 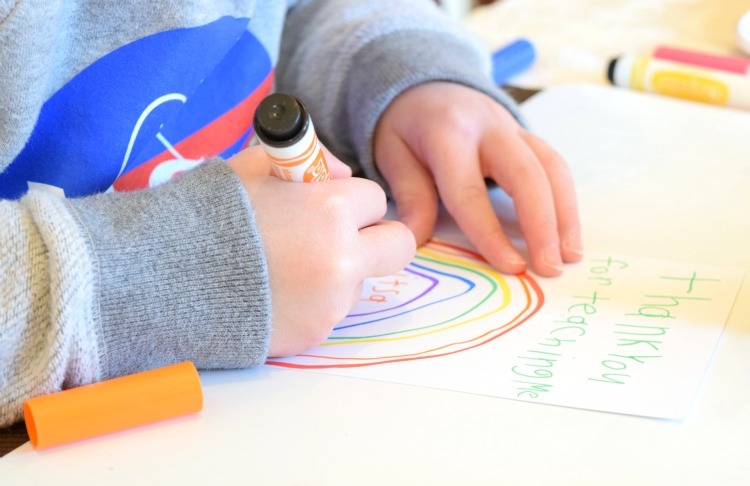 While we made these Kindness Cards for Sunday school teachers, you could certainly make them for ANY teachers in your son or daughter's life. Preschool, dance, gymnastics, swimming, and music teachers are all SO deserving of our gratitude. Here's the thing. Teachers don't need expensive or elaborate hand-made gifts. They don't even need a gift card for the office supply store or coffee shop (although I know those things ARE appreciated, too). Teachers are teaching because they love your kids. 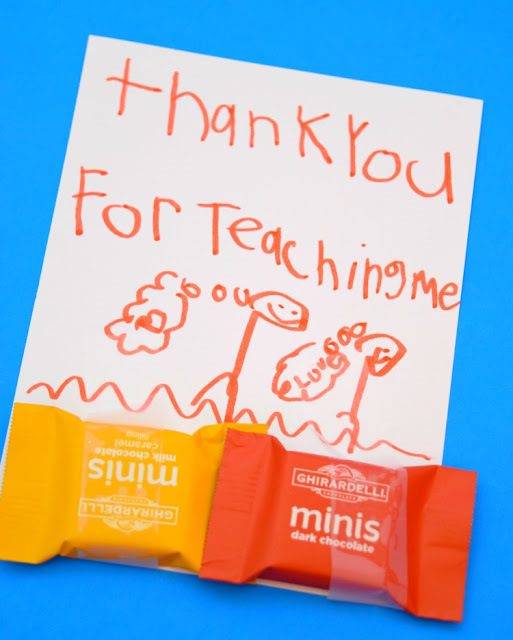 A handmade note or card, with a little sweet bite attached is a great way to show them how much you appreciate them. 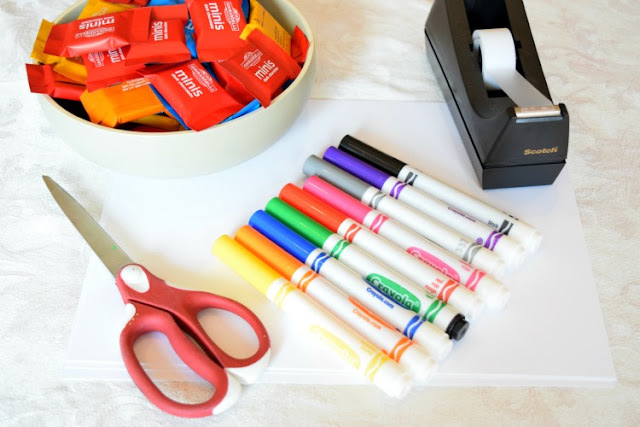 For this project, all you need is white cardstock, scissors, markers, tape, and some small goodies. We used mini Ghiradelli squaresbecause they were small enough to fit a couple on each card, and because they were flat and easy to tape on. 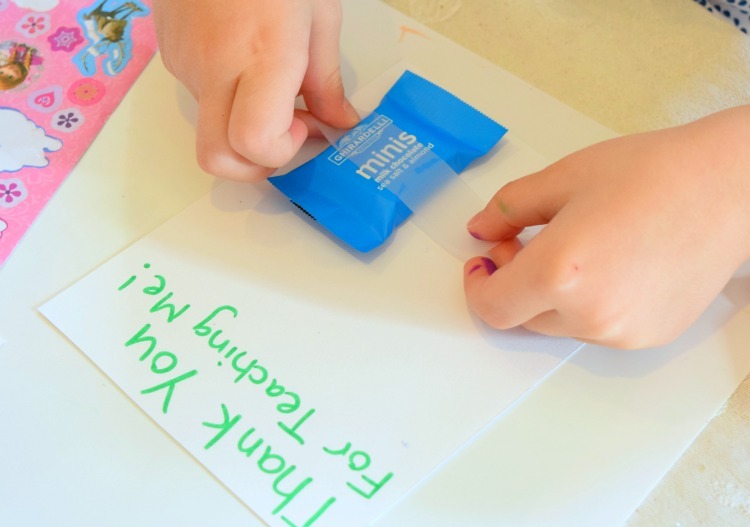 Cut your cardstock into quarters. Write a simple "Thank You" message on the top. 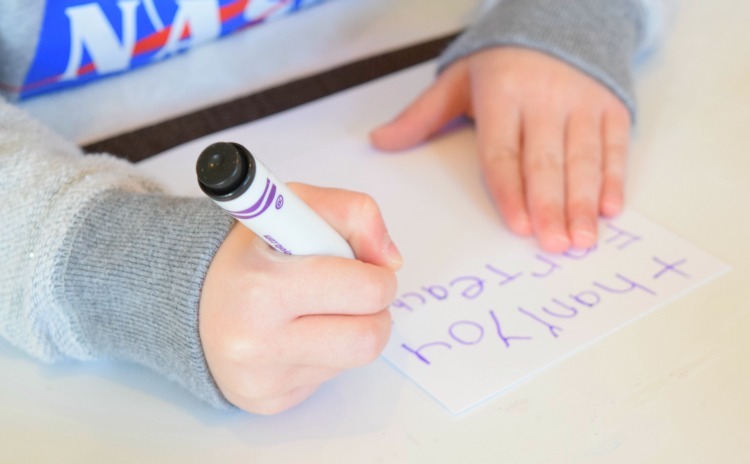 Older children can write it themselves. Then have your child tape on some chocolates, and draw a sweet picture. My girls signed their names on the back, and added a few coveted "Frozen" stickers (the ultimate in generosity). Then hand them out next time you see your favorite teachers. That's it! Couldn't be simpler! 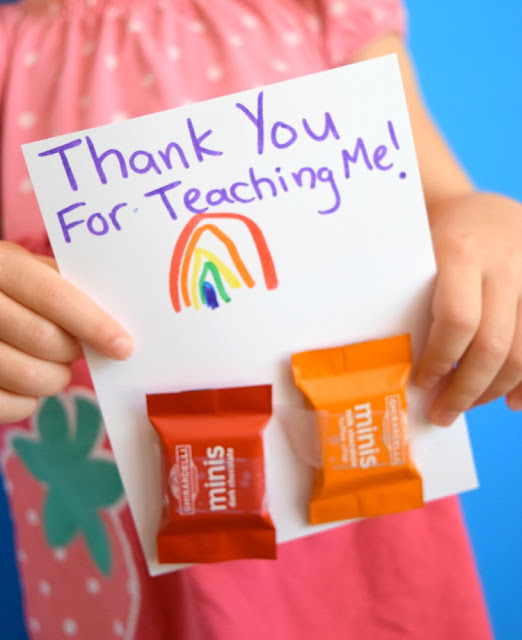 You've taught your children a little bit about being kind and showed your gratitude for the teachers in your life. 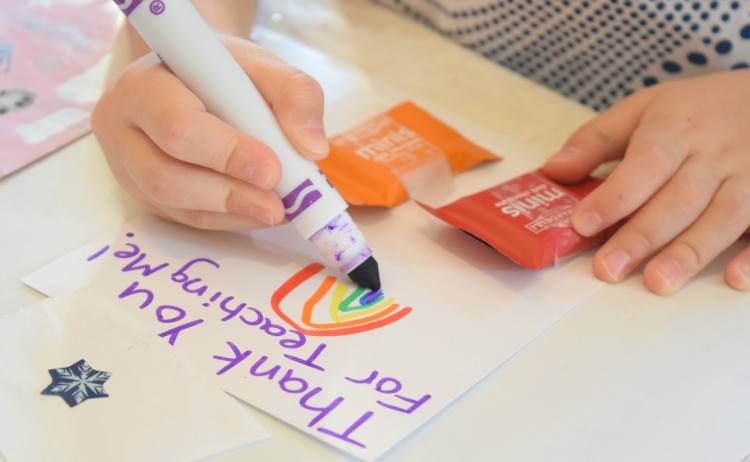 This post is part of a "100 Acts of Kindness" challenge hosted by Coffee Cups and Crayons and Toddler Approved. Follow along for TONS of kindness inspiration! This one's for you, Ms. Judy! 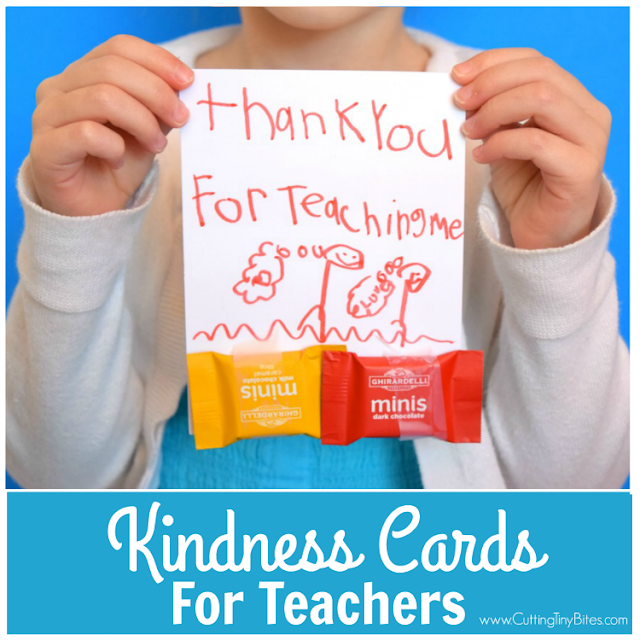 Kindness Cards for Teachers. 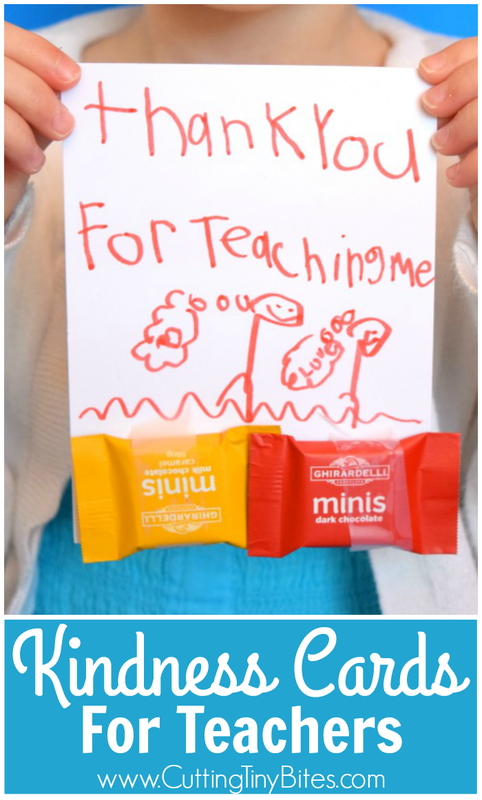 Simple act of kindness for children and parents to show teachers how much we appreciate them!